Who’d have thought three hours per week was hard to find? I could have easily made it today except that I spent most of a day beginning to catalogue my books, courtesy of a barcode scanner I acquired during the week, and the very useful goodreads.com. If you want to know what I have on my bookshelves, feel free to take a peek. While I was digging through my books, I came upon the most excellent The Elements of Typographic Style by Robert Bringhurst. The book itself is beautifully designed and printed, and has more information about typography than you could absorb in a long time of study. Picking it up I recalled that it had a list of the traditional names for the different sizes within a typeface tucked into the margin of a page. I figured that I could play with them a little as an exercise and set a guide to type sizes. Because these are older names for typefaces, I thought a fairly traditional typeface would be best, and having spent some time reading The New Yorker earlier today, decided that Caslon would suit well. I had Adobe Caslon available so used it. I chose to set this in a 5″x3″ format, with the constraint that I wanted to be able to print it on a laser printer directly onto an index card. That meant 0.5″ margins, which definitely constrains some approaches to playing the text, especially with respect to a title for the card. So that a right-handed person would hold and turn the card easily, I ran the title down the right hand side of the card. A 14-point font meant the title ran the height of the main text block, so I used that for balance. The automatic leading set by InDesign didn’t quite feel right because of the mix of ascenders and descenders so I tweaked that a little to get a good vertical sense of rhythm down the lines, although I’m not sure I have it quite right. Using the text figures in the left column didn’t feel right with the standard settings so I needed to kern them a little tighter, or else the 10 seemed to stretch far too wide, especially in relation to the 11 below. The mix of ascenders and descenders was particularly challenging to deal with so I had to hang the occasional numeral a little higher or lower. I also played with using titling figures but they just swamped the text given that I set it all lowercase. And so, at the end of the playing, we have a 5″x3″ index card with the old-fashioned names of the font sizes. I suspect that a real typographer could do a lot better but this is all about learning! 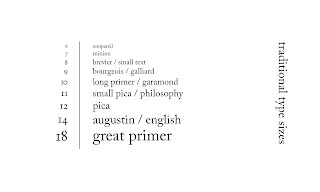 Cool – I had no idea font sizes had names! I think you have the layout about right, it looks good to me. But – why did you decide to use all lower-case? Was this a style decision, or a subconscious reflection of the growing social internet tendency? All lowercase seemed right. Words take on a different character with mixed case. In English, in particular, use of uppercase initial letters also implies something specific about the word–either that it is a proper noun, which these aren’t necessarily, or that they start a sentence, which these don’t. So lowercase seemed more appropriate. The visual balance is really different as well and I preferred this look.